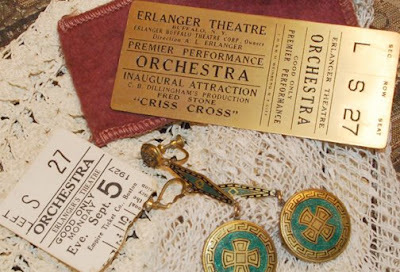 This assemblage was inspired by a 1927 brass theatre ticket which belonged to my grandmother, Virginia. I often imagined this performance… everyone dressed in their Art Deco finery, filled with anticipation as the orchestra began to play. Again using my favorite portrait of my grandmother as the focal point, this assemblage pays tribute to those elegant evenings of long ago. 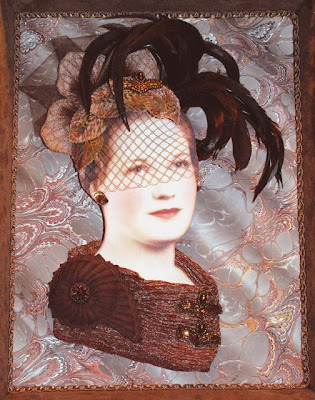 Embellishments include: antique copper beaded embroidery trim, vintage glass button and cabochons, vintage horsehair veiling, antique ribbon cockade, vintage millinery feathers, velvet millinery leaves, netting, contemporary embroidered flower ornament, and silk fabric. Hand-marbled background paper by Iris Nevins. What an incredibly beautiful tribute. You are so wonderfully creative. Thank you for sharing this! WOW! So very lovely. YOU HAVE FINISHED!!! I love the FEATHERS!!!! my what a ticket can inspire.... LOVE THE OUTCOME! It is so good to see your grandmother get out again! She is such a beautiful woman and you always dress her in the most fantastic manner! Cathy, this is so lovely! You've perfectly captured the beauty and elegance of another era. A brass ticket...can you imagine how exciting it was to experience such an evening?! Another absolutely priceless commemoration of your heritage!